Oh the irritation of two standards! 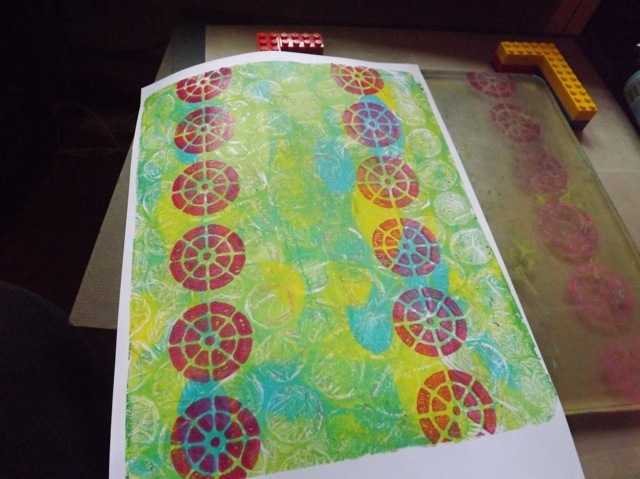 The Gelli plate is 8 x 10 and A4 paper is… not. I was finding that all too often my pulls were not QUITE as lined up as I would have liked them to be. Sometimes there was a pattern from a layer off-centre, or drifting off the edge, leaving a blank area on the opposing side. 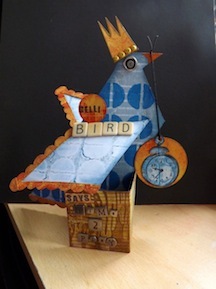 Now, I KNOW part of the joy of the Gelli is the randomness and the SURPRISE element of a pull – you just don’t always know what you are going to get! But there are times when you really do want to do an intentional pull, when you want things to line up. Let’s say you wanted to frame something, for example, and wanted the edges to be fairly neat. This may help with that. OK so there are really two parts – first, I was tending to use my plate still stuck to the clear backing plastic sheet it comes on. THAT resulted in a bit of slippage – the plate would sometimes slide about when I was brayering on the paint. To solve THAT problem, I bought a cheap (£1) teflon baking sheet and stuck it to a larger piece of matboard. I just used double-sided tape. This is not a permanent bond to the TEFLON (it sticks pretty solid to the matboard) but you can easily peel off the Teflon sheet for cleaning or replacing. You may need to add more adhesive at some point, but not every time. Try to stick it as flat as possible – the fact the Teflon doesn’t stick completely securely to the tape will allow you some wiggle room. That, in and of itself, is handy. As you can see it lets me work on my desk (or would if it wasn’t a horrible mess) or on my little side table, and I can pick the whole thing up and move it off to the side if I need to. 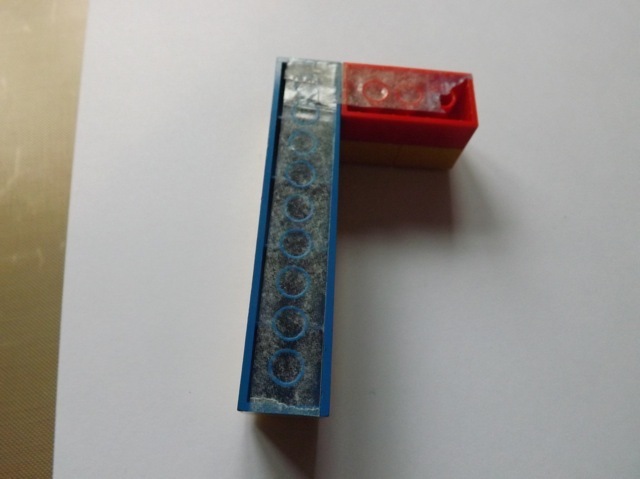 Part two is the equivalent of a stamp positioner, and uses that old staple of the home-made stamp positioner, Lego Bricks. Just build a couple of corners (or ask any 8 YO kid to do it!) then add the double-sided tape to the bottom. The tape will stick well enough to the Lego to let the Lego stick to the Teflon but is still removable. I will store these Lego corners stuck to a bit of plastic. 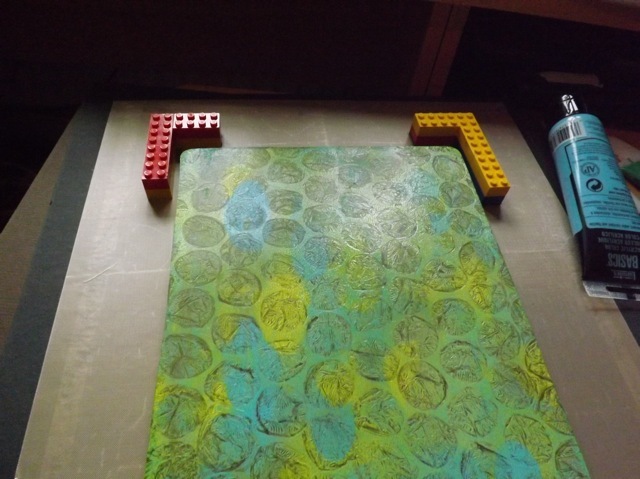 I could even just stick then to the top of the Gelli Plate box, they won’t stick forever but should stick well enough to store them. 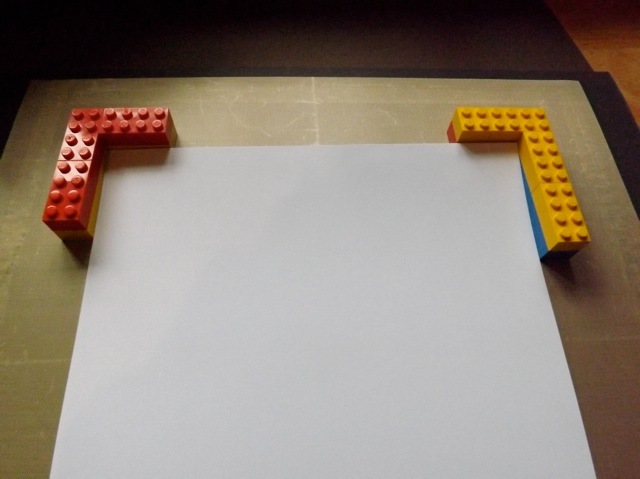 Lay a piece of the paper you intend to pull on over the plate then frame the top two corners of the paper with the Lego corners. Now, I made the decision that the most useful placement FOR ME is an A4 sheet of paper on the 8 x 10 Gelli plate. Once I had placed the corners I removed the paper and drew around the base of each corner with a Sharpie. 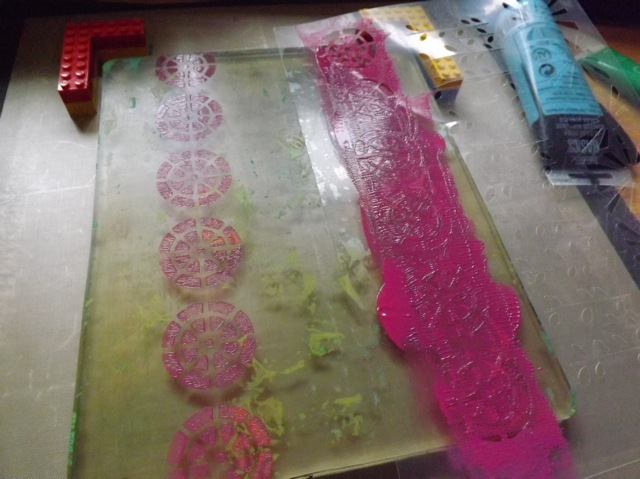 I don’t feel you need to draw around the Gelli plate – so long as it is close to centred within the corners and stays in the SAME PLACE for the entire multi-layer pull it will be fine. I worried the Sharpie might stay on the plate if I drew around it anyway. 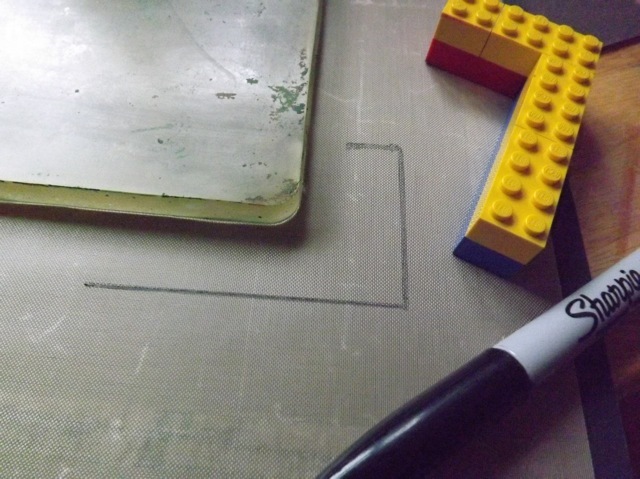 Place the Lego corners, then slip the paper into the corners and down onto the plate to pull. I didn’t have any trouble applying the pressure I needed to pull the print with the corners in place, but once the paper is placed you can certainly remove them to get fuller pressure if you need to! OK, now you can add your second layer of paint as you like. I thought about the reasons why placement might be important, other than simply getting neat edges, and thought about a border sort of design. Really I should have had the border hanging off the edges, which would have demonstrated it better, but it’s early and I’ve only had one cup of coffee! I added the hot pink thru one of my Cricut stencils. I was lazy and left the corners in place and it was fine. Check out the near perfect match! I have NEVER achieved even close to that eyeballing it. I can see this working well with masking, if you want to ensure something is going to fall exactly in the same place. If you are using different sizes of paper, all of which are larger that the Gelli plate, you could easily draw the corner placement in different colours. With smaller paper this is not going to help you at all – unless you stuck the smaller sheet to one the size of your usual sheet (for me, A4) and then lined up to the larger sheet. That would work. 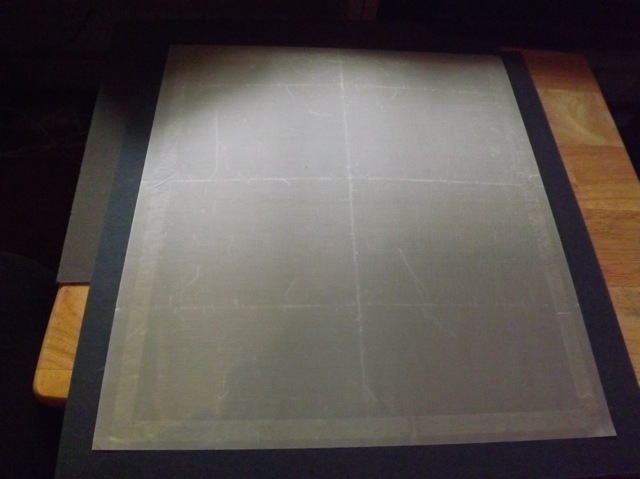 Might also give you an interesting surround on the base paper, rather frame-like once you remove the smaller sheet. Gotta love a twofer, hummm? You COULD use it effectively with the 6 x 6 inch plate, if you wanted to do a complex, multi-layer pull and have it all line up centred on a larger sheet. Then you could easily frame the print with a nice border around it. It would look fab on say watercolour paper, or in the middle of a large format dictionary page or even scrapbook paper! HTH if you ever want to be precise with your prints. And if you don’t have kids who have Legos, Duplo (the toddler version that is much bigger) may work as well. 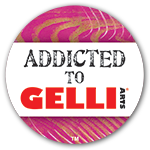 Categories: art, Gelli plate monoprints, tutorial | Tags: art techniques, Gelli, Gelli plate, how-to | Permalink.